$ The economic impact of the Internet of Things will be measured in $trillions. ∑ The number of connected devices will be measured in billions. ∞ The resultant benefits of a connected society are significant, disruptive and transformational. Yet along with the many societal, environmental and economic benefits, the rapidly-expanding connected world, represents a growing attack surface for adversaries of all denominations. Everyday vulnerabilities in IoT are being exploited with malicious intent – yet the vast majority of them can be prevented simply and cost-effectively. 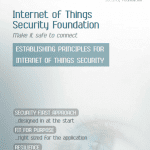 Enter the Internet of Things Security Foundation (IoTSF): We aim to make it safe to connect so the many benefits of IoT can be realized. IoTSF is a collaborative, non-profit, international response to the complex challenges posed by cybersecurity in the expansive hyper-connected IoT world. As such, IoTSF is the natural destination for IoT users and technology providers including IoT security professionals, IoT hardware and software product vendors, network operators, system specifiers, integrators, distributors, retailers, insurers, local authorities, government agencies and other stakeholders. Want to self certify against our IoT Security Compliance Framework and use the Best Practice User Mark? Watch the video: An introduction to the IoT Security Foundation, presented at the 2015 inaugural conference. Watch the video: IoTSF Chairman Paul Dorey delivers his opening address at the 2018 IoTSF Conference. Security is a critical element of IoT deployment, yet it is too often neglected in the development of systems. This primer guides the reader to important questions that should be considered when designing an IoT device, system or network. The common theme throughout is that considering security at the design phase can not only save time and effort later, but potential embarrassment and financial loss in the future.